This is it – the signature burger. It was my birthday and the Lady had decided to take me to db bistro moderne in Marina Bay Sands. The restaurant is one of a chain run by chef Daniel Boulud, a French restaurateur with restaurants in New York City, Palm Beach, Miami, Montreal, Toronto, London, Beijing, and Singapore. His restaurant in New York City, Daniel, is a Michelin 3-star restaurant. The Lady knows I have a passion for a good burger. As I once said to the executive chef at the Renaissance Hotel in Seoul back in the early 1990s, “anyone can cook a reasonable duck l’orange, but it takes a master chef to produce a brilliant cheeseburger”. I should note that he then proceeded to cook possibly the best cheeseburger I have ever had! The Original db Burger was not that burger! Overall the burger was nice, the mix of foie gras and good quality meat provide a nice flavour combination but I think my issue with this burger is that attempt to make it 3-Michelin star standard – something a burger, no matter how nice, should ever be. The attempt to keep height in the meal meant the meat patty was very thick (and yes, that is partly to contain the foie gras) and that thickness makes the patty difficult to cook evenly. That thickness is a problem as I like my burgers well done so where the centre was cooked, the outside was almost burnt. The chips (OK, pommes frites) were nice enough but were over salted – more on that later. The burger is served on a very large plate and the serving makes it a little reminiscent of the old days of nouveau cuisine where the meals were pretty but left you looking for a cheeseburger on the way home. 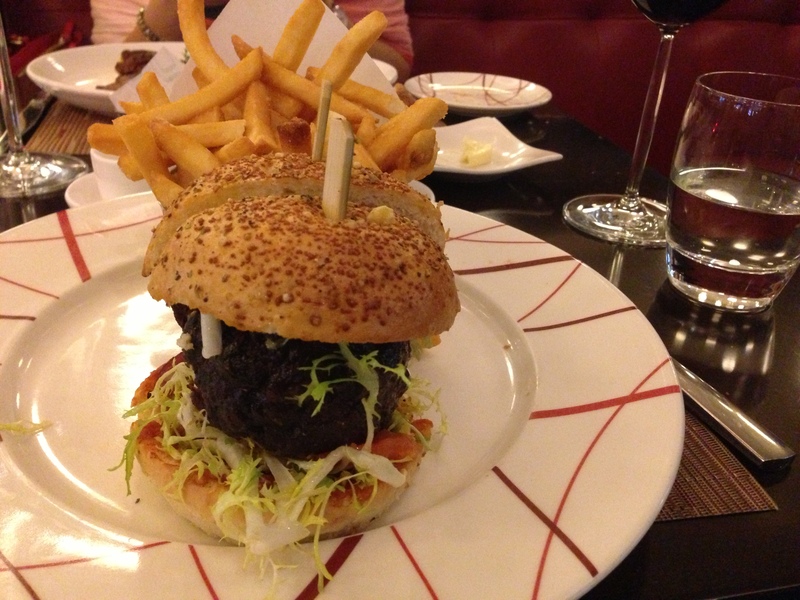 $42++ ((all pricing is in Singaproe dollars here)) for the burger though? Way overpriced for what it was. The restaurant may see itself as an exclusive, fine dining establishment but there are a few cracks there too – more on that later. I was glad to have had an onion soup to start with otherwise I may have been looking at the golden arches on the way home. The Baked Alaska flambéing away! The Lady decided to have a set menu and her choices were a seafood pasta followed by two types of beef – one I think was a sirloin cut, the other was from the flank. She had selected the Baked Alaska for desert. I tried her entrée as she was not happy with it. It was a seafood pasta in a butter sauce. The sauce was so salty. The whole dish had been over-seasoned. Serving a butter sauce (in itself a little salty) over a pasta that I am sure was cooked in salted water with seafood cooked in the butter (and I am guessing salted some more) would have been lovely except for all the salt. The Lady is used to salt and salts her cooking well but this was just too much salt. In fact, the over-seasoning seemed to attack both the burger and her main course as well as it was quite salty. Now I know that many places like salty food to encourage the patron to drink more but this is a classy restaurant – surely they are above that? Her main course was so memorable that neither of us can really remember it 24 hours later. 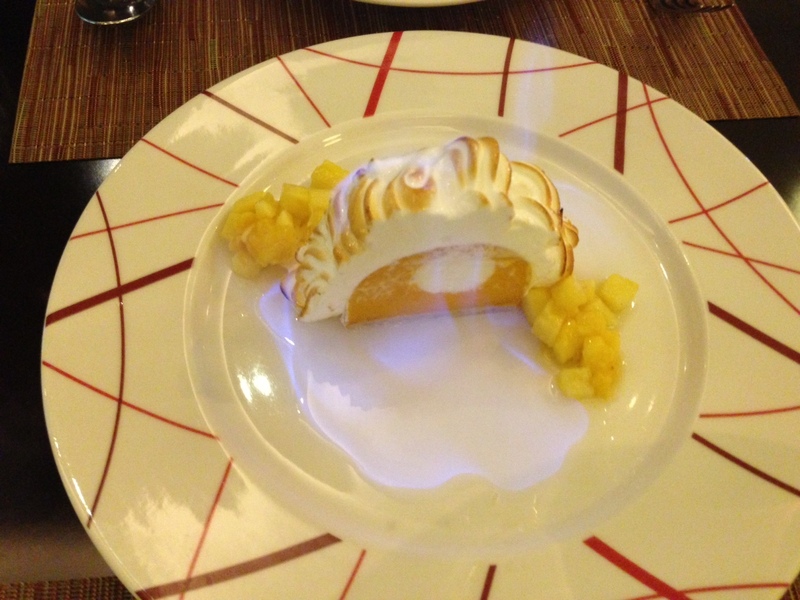 The saviour food-wise for the evening was the Baked Alaska. It was a 9/10 dish. It even looks good up there. Apart from the food, there were other disappointments too. The tables are small. That’s nice, you can be close to your dinner companion and it feels a little intimate. This mood is destroyed almost immediately by the noise of the restaurant. It is a very noisy restaurant. The décor seems to just echo sound. The maître d’ was excellent as was the wine waiter (or perhaps sommelier). The serving staff were a little too attentive for my liking except when they needed to be. I mentioned the small table. The plates are huge so two plates and a condiment tray across the table and the plates are starting to hang off the edge. I am eating a burger which entails some finger work to be eaten properly so it was not totally unexpected when I knocked my knife off the table. Attentive waiter number one rushes over and picks the knife up and says they will bring another one. It never arrived. That didn’t matter so much as I knocked the fork off as well about 5 minutes later. That I retrieved myself and again, it was never replaced. Overall, it is an interesting place and we are glad we have eaten there. After $42++ for the signature burger, I have a renewed respect for the $3.85 Mos Cheeseburger!